The new iOS 12.1.4 software update was released last week, the update was designed to fix the Group FaceTime bug in iOS. 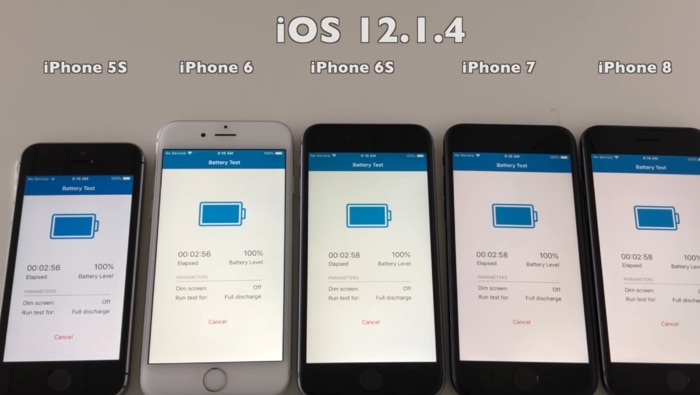 We have already seen some speed tests for iOS 12.1.4 and now we have a battery life test for the new OS will it bring any battery life improvements to Apple devices, lets find out. As we can see from the video there are some minor improvements on the battery life of some devices but no major improvements. This is something we also saw in the speed test videos, there were no major speed improvements in this new update. It looks like the iOS 12.1.4 software update only contains the various bug fixes we heard about last week, lets hope there are some speed and battery life improvements when iOS 12.2 is released. We are expecting iOS 12.2 either at the end of February or a the start or March.